Does PRP Therapy Work for Hair Loss? Hair loss is a huge concern for both men and women. What can start as just a few hairs falling out or shedding, can potentially lead to baldness. Regardless of whether you’re impacted by excessive shedding, balding, or anything in between, any type of hair loss can feel embarrassing. At Arizona Dermatology, we understand how hair loss can affect your quality of life—which is why we simultaneously focus our efforts on restoring your hair loss and your self-confidence. In order to combat hair loss, we have multiple hair restoration treatments for you to choose from including a non-surgical procedure called Plasma Rich Protein, or PRP. PRP Therapy was established two decades ago as a proactive therapeutic option for male and female hair loss. The purpose of this article is to inform you on what PRP Therapy is, the effectiveness of the treatment on hair loss, and help you decide whether this treatment is right for you. Here you will discover the ins and outs of Plasma Rich Protein Therapy, including how it works and what to expect during the appointment, procedure, and recovery stages. PRP Therapy is centered upon the logic that hair will grow if your hair follicles and hair roots are healthy. In order for your hair follicles and hair roots to remain in good health, they must receive blood supply as their main form of nutrition. PRP Therapy is based off of this premise. The therapy consists of providing your follicles and roots with blood plasma from your own body to encourage the growth of new, healthy hair. During this treatment, your blood plasma is concentrated with 3-5 times the number of platelets that are typically found within normal blood circulation. Another concept crucial for understanding the PRP Therapy process is that the treatment uses your own blood to produce results. In other words, only your own naturally produced fluids are entering your system. This significantly reduces the likelihood of any foreign reaction, including body reactions or immune rejections—leaving you worry-free. Typically, an individual’s knee-jerk reaction to the words “blood,” “procedure,” or “injection” is to be frightened. 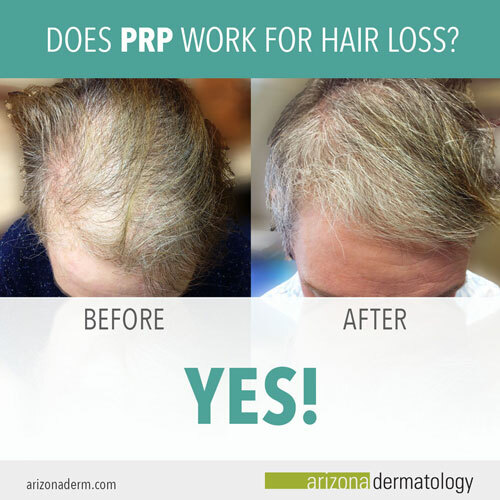 At Arizona Dermatology, we want to remove this negative association by being transparent and educating you on the stress-free steps of our PRP Therapy procedure. Here you will discover what happens during your appointment, procedure, and time of recovery— because we believe that nothing should stand in the way of restoring your hair loss. The first step in the process of undergoing PRP Therapy is setting up an appointment at your nearest location. At our locations throughout the Valley, we pride ourselves on our experience, longevity, trust, innovation, and care, which is why we want to meet with you for a consultation before making any immediate treatment decisions. During your consultation appointment, our friendly staff is here to ease your concerns and go over any questions or hesitations you may have. It’s important for us to learn every detail of your personal circumstance and immediate goals before we conclude a solution. By putting you first and understanding your needs, we’ll be able to determine if PRP Therapy is the absolute best treatment for you. At the end of your consultation, we will accurately determine if PRP Therapy best caters to your desires. If we conclude that this treatment is the most successful way to reverse your hair loss, we will schedule another appointment at your convenience for the non-surgical procedure. We draw your blood like any standard blood drawing from your doctor’s clinic. Approximately 60cc of your blood will be placed in a special container. The special container is then placed in a machine called a centrifuge. The centrifuge will spin your blood for approximately 15 minutes. Once the spinning is complete, your blood components will separate. The platelets with abundant growth factors are then injected into your scalp where thinning is present. After the procedure, the treatment immediately starts working to restore lost hair. Previous results have included new hair growth and thicker hair consistency. PRP Therapy is a unique hair restoration treatment in which there are few risks—and no recovery time. It is a completely safe procedure, with mild side effects such as minor tenderness and swelling. If you are looking to avoid both the aggravation of a slow recovery and the embarrassment of hair loss, PRP Therapy might be the right treatment for you. Does it Actually Work for Hair Loss? Before any treatment, it’s important to educate yourself. Since PRP Therapy is a fairly new procedure, we understand your feeling of uncertainty regarding such an incredible hair restoration treatment. Next we will focus on the facts that determine if PRP Therapy produces successful results for hair loss. 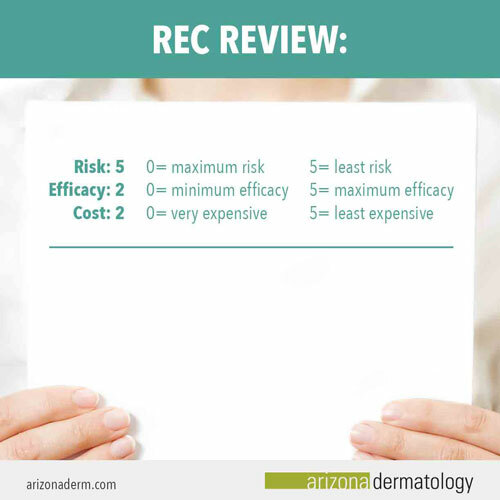 At Arizona Dermatology, we strive to provide our patients with treatments that will give them the most satisfaction. Because of this, we would never offer any treatment, including PRP Therapy, without being certain of its results. Below you will find research studies that support this claim. A recent study on PRP Therapy conducted by Bio Med Research International investigated the safety and clinical efficacy of the injections on pattern hair loss. The study observed 10 patients suffering from varying hair loss characteristics, whose ages ranged anywhere from 22-60 years old. After three months of observation, the patients’ hair was tested by performing a hair count test and measuring the overall density. The results were conclusive, revealing that PRP injections improve hair density, growth, and thickness. Additional research on the success of PRP Therapy for hair loss was performed by the US National Library of Medicine National Institutes of Health. This particular study observed 11 patients suffering from the repercussions of hair loss over a three month period. The results were obtained through a hair pull test before and after each treatment, which revealed that PRP Therapy is a simple and effective way to reduce hair loss and obtain a high overall patient satisfaction. Below is a summary of the conclusions from this study. PRP Therapy is proven to be a successful treatment option for individuals who experience hair loss due to both hereditary and metabolic factors. However, in order to maximize and maintain your results, we recommend following appropriate treatment guidelines. Our guidelines include undergoing 3 treatments at 6-8 weeks apart and maintaining results with additional treatment every 6-12 months. When abiding by our suggestions, your probability of successful results will increase significantly. If you are still contemplating if PRP Therapy is right for you, we recommend looking over our pros and cons of the treatment. Should you feel that PRP Therapy fits your needs, contact your dermatologist to set up your consultation appointment. We understand that PRP Therapy is not for everyone, which is why we offer other hair restoration treatments that are just as successful. If PRP Therapy doesn’t sound like the right treatment for you, consider other treatments such as Hair Laser Therapy and Hair Transplantation. Everyone ages. But for some individuals aging comes quicker than expected, which could bring on embarrassing hair loss. Don’t let hair loss affect your self-esteem—contact us at Arizona Dermatology! Our accredited doctors across the Valley will help you schedule an appointment and determine what hair restoration treatment will bring you the most success. If you are looking for more information on PRP Therapy, download our PRP Brochure for details including treatment suggestions, before and after pictures, and more.